Visit the Le Petit Croissant booth and take home a box of handmade jam and croissants for the family! Round morning buns with cinnamon sugar and raisins. Macarons. New for 2019! I also teach classes on how to make these at high altitude. Scones. I bake my orange cranberry, and lavender, scones fresh every market morning. Baguettes. My baguettes are more correctly called “batards” because they are 16″ rather than 22″ long. I also teach a class on this. Jams. Selection varies every week, but usually includes best-sellers such as Strawberry Blueberry, Ginger Peach, Tropical Vacation, Stone Fruit & Blueberry, and a host of other flavors. Fig lovers, I carry Apple Fig and regular Fig, too! I set out lots of flavors for sampling at my booth, so be sure to stop and give one a try. Granola. I offer just one flavor because I can’t seem to improve on it. In fact, some customers come to my booth just for the Cranberry Almond granola. 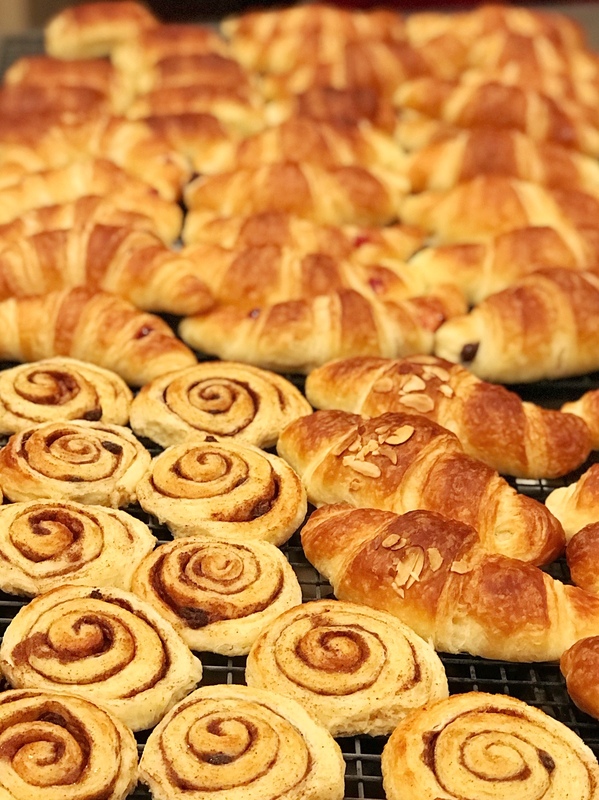 Croissant pre-orders can be placed a few days in advance of any market simply by emailing your choices to me (or requesting a price list) at leah@lepetitcroissant.com. You can pre-pay online, too, then pick up your order at any of the markets listed below. No need to get there first thing anymore for fear I’ve sold out of your favorites! Special orders are always welcome. Thanks, and see you indoors at this winter market!